Well, yesterday was my birthday & I waved goodbye to my 30s. I also just happened to finish my current sketchbook the same day (I rip through at least one a month) & my new scanner was delivered. So put it all together & what do you get? A blog entry with some scans from my sketchbook. I'm a perfectionist by nature (& I don't mean that in a good way) so I have to approach my sketchbooks with the attitude that they're for my eyes only & it doesn't matter how messy & unfinished they are. If I was too conscious of showing them to other people, it'd defeat the purpose of having a place to scribble down the seeds of ideas that may or may not grow into something. So for that reason, my sketchbooks are not particularly interesting...but here are a couple of the less scribbly pages. You might recognise the fox from my Fox & Flowers print. The colour samples are gocco inks. In other news...I've been adding more pages to my blog, including one about my mailing list (there will soon be a link to it in my sidebar). 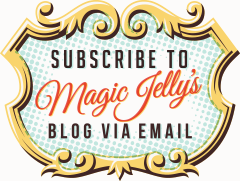 Just wanted to let you know that subscribers to my mailing list will be eligible for monthly giveaways & the first one will be held at the beginning of November, so go join my email list if you'd like to be in the running for regular Magic Jelly freebies!